Coordonnateurs : Cherny Nathan, Fallon Marie, Kaasa Stein, Portenoy Russell K., Currow David C.
Nathan Cherny is Norman Levan Chair of Humanistic Medicine and Associate Professor of Medicine at Ben Gurion University, Israel. Nathan is also Director of the Cancer Pain and Palliative Medicine Service at the Shaare Zedek Medical Centre, Jerusalem, Israel. Marie Fallon is the St Columba's Hospice Chair of Palliative Medicine at the University of Edinburgh and is an Honorary Consultant in Palliative Care at the Western General Hospital in Edinburgh, Scotland. 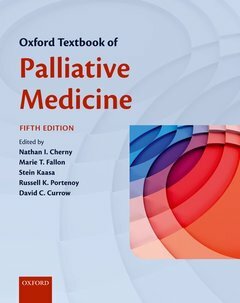 Stein Kaasa is Professor of Palliative Medicine at the Institute of Cancer Research and Molecular Medicine, Faculty of Medicine, Norwegian University of Science and Technology, Trondheim (NTNU), Norway. Russell K. Portenoy is Chief Medical Officer and Director of the MJHS Institute for Innovation in Palliative Care, New York, and Professor of Neurology and Anesthesiology at Albert Einstein College of Medicine, New York, USA. David C. Currow is Professor of Palliative and Supportive Service at the Flinders Centre for Clinical Change, Flinders University, Australia.